The group of seniors and juniors begin to roll into Gym 1 for their two day training for the new incoming freshmen. San Rafael High School Link Crew prepares their students to welcome the new parents and students for this 2018-2019 school year. Link Crew has partnered with the Anti-Defamation League to strengthen their “No Place for Hate” to create a better community in the school. They continue this year to try and make every student feel welcome and safe on the school campus. Dr. Maggie Heredia, Assistant Principal at SRHS, is the advisor of Link Crew. She has seen numerous freshmen come in and out. She has also seen its effect on students, staff and parents in the SRHS community. This opens new doors for the program and community. 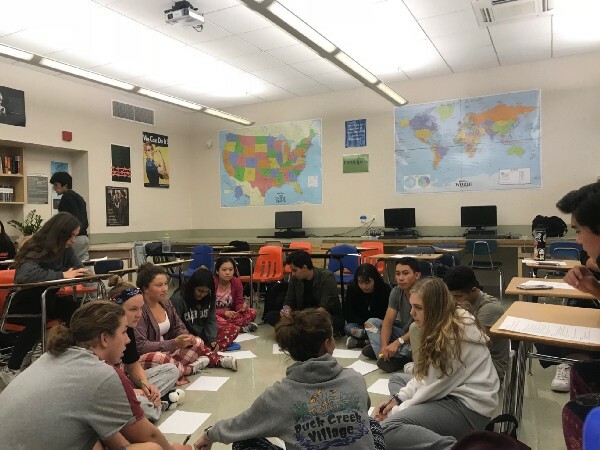 “Link Crew provides an immediate connection for students to be more positive, energetic, and to help better their communities,” Dr. Heredia says. That is what Link Crew has to offer for the freshmen. Freshmen are having to adapt to the high school environment during the first weeks of school. The change of school environment differs for each student, but they are always providing support with the link crew students. “They had us understand the difference between Middle School and High School. The more they explained,” Isabelle Alioto, a freshman at SRHS, says. Link Crew students are there for questions and to help students. The more they become involved with the freshman the more reassurance those freshmen feel during their first year in high school. As the year continues, Link Crew visits freshman advisories every month to strengthen the relationship between the students. Link Crew is now more inclusive and involved with the freshmen. “They helped us by answering all the questions we had and they helped us know the campus better and the school environment,” says Briana Muschi, a freshman at SRHS. “They help us with the high school experience,” Isabelle Alioto says to further explain. She feels comfort knowing that, if she has questions, they can be answered by a Link Crew student. Faye Padayachee has been the Link Crew coordinator for the past two years. She has been doing most of the planning of Link Crew orientation and advisory push-ins with freshmen. She has also started a Link Leadership Class at SRHS. The class did a training course in October to make sure the students are getting more structured training on being community leaders. The Link Leadership Class was added this year with the goal of improving the culture and climate of the school. It should not be confused with the Link Crew Program, even though they have the same end goal. “The class is driven by the students. They are able to have time within the school day to develop relationships with outside organizations, find resources for our school, improve push-ins and plan school/community events,” says Ms.Padayachee. The parents of SRHS have also been benefitting from this program. As the first weeks of school go by, teachers get ready to see parents at Back to School Night at SRHS. The Link Crew students put on their red shirts and get ready to help teachers and parents. “Students go above and beyond to support the community,” Dr. Heredia says.“They did not hesitate to help guide the parents in the right direction.” She saw how kids would take the parents to the classes and talk to the parents that were in need of help. Many parents walking around felt like they could ask for help. The parents were able to met with teachers on time and get to know what courses their students were taking at school. “Parents are suppose to feel like the high school is there to help them throughout the campus,” Kellyn Garcia says. She was one of the many students helping out at back to school night. She had also been there as a cheerleader welcoming the parents entering the gym. Dr. Heredia says that the staff is seeing the leadership skills of Link Crew students increasing. The Link Crew students want to make sure they are carrying that throughout all their classes. Orientation helped freshmen understand the rules when it comes to teachers and the fact that they they are not in middle school anymore. Teachers use the Link Crew students to their advantage. “Teachers use the Link Crew on the first day of school to tell us information to tell our freshmen about dates and events,” Ms.Garcia explains as she collects extra information to tell her freshmen. Dr. Heredia states that our Link Crew students really do care for the SRHS community, but not just at a rally or at back to school nights. They show they effort they put into the community and their school. There are bigger and better improvements going into the program. “It’s not just the t-shirt that they wear, but the actions that they carrying,” Dr. Heredia says.